On November 15th 2018 Jos A. Massard and Gaby Geimer discovered a female of the wandering cribellate spider Zoropsis spinimana on the window of a pastry shop in Echternach (Massard & Geimer 2018). 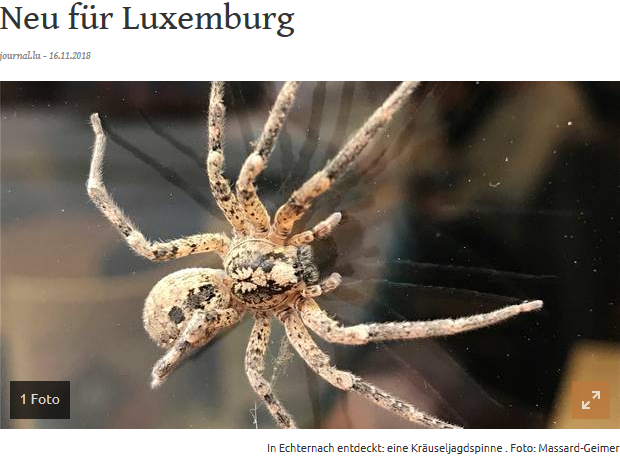 This spider is a new species for Luxembourg and is currently spreading throughout Europe. The detailed up to date distribution of the species can be found on the Luxembourgian Wikipedia (Wikipedia-Bearbeiter 2018). The home of Zoropsis spinimana is the western Mediterranean region up to the southern edge of the Alps and Dalmatia, as well as North Africa, where it occurs in the open in light forests, under stones and bark or in and at buildings (Wikipedia contributors 2018). Last updated on Monday, November 26, 2018. The species has not yet been documented in Luxembourg. ISEIA protocol: A0 (3+3+3+2) = Alert List (Ries et al. 2017: 68). Last updated on Tuesday, April 10, 2018. Distribution map of Dicranopalpus ramosus (Simon, 1909) in Luxembourg. Recorder database, MNHNL, 20.04.2019. Five occurrences of the species in Luxembourg are documented in the Recorder database, the first dating from 2007. In the Gutland meanwhile widespread, in the Ösling probably still largely missing (Muster & Meyer 2014: 38-39). ISEIA protocol: C2 (2+2+2+1) (Ries et al. 2017: 68). Muster, C. & M. Meyer, 2014. Verbreitungsatlas der Weberknechte des Großherzogtums Luxemburg. Ferrantia 70, Musée national d’histoire naturelle, Luxembourg, 112 p.
Last updated on Friday, July 13, 2018. Distribution map of Brigittea civica (Lucas, 1850) in Luxembourg. Recorder database, MNHNL, 20.04.2019. 29 occurrences of the species have been documented in Luxembourg in the Recorder database under it’s synonym Dictyna civica (Status: July 2018). The species is estimated to be very common. ISEIA protocol: C3 (2+1+2+1) (Ries et al. 2017: 68). Last updated on Tuesday, July 10, 2018. DNADIVE aims at developing a molecular toolbox enabling eDNA detection for Invasive crayfish in streams of Luxembourg. This Public2 Partnership project has been accepted by FNR in November 2017 and will start on 1st January 2018. The project will be hosted by Fondation faune-flore and it’s principal investigator will be the French researcher Dr David Porco. Project partnership: Luxembourg National Museum of Natural History (MNHNL), Luxembourg Institute of Science & Technology (LIST), Water management Agency (AGE), Ministry for Sustainable Development and Infrastructure (MDDI), University of Duisburg-Essen (Germany). DNADIVE aims at developing a toolbox for the molecular monitoring of invasive crayfish in the streams of Luxembourg. Three exotic species (Orconectes limosus, Pacifastacus leniusculus and Astacus leptodactylus) and a native one (Astacus astacus) will be targeted for the project. This molecular toolbox will encompass several techniques of detection comprising (1) a simple amplification method easily performed in a laboratory with few elements, (2) a digital droplet amplification (ddPCR) which is a more elaborated lab method that can allow for a higher detection sensitivity and a possible quantification of DNA that could be related through the proxy of biomass and abundance to the size of the populations detected and (3) an isotherm amplification method (iPCR) i.e. a simple, cost effective approach which will allow for a field detection usable by non-trained agents. The results will enable the development of a predictive species distribution model for the target species and to infer their impact on freshwater communities through the comparison with previous sampling campaigns. This set of methods has the high potential to efficiently contribute to early detection and routine monitoring of the invasive crayfish species in Luxembourg, thus allowing for a timely and efficient decision-making and appropriate management. Last updated on Monday, December 11, 2017. On 19th September 2017, a forester captured a Nutria (Myocastor coypus) in Osweiler (commune of Rosport, eastern Luxembourg) and put it to sleep. This detection of an IAS of Union concern (Anonymous 2016) has been notified by the Luxembourg authorities on 26 September 2017 and an Eradication Measure Set has been submitted as well on 26 September 2017, pursuant to Article 17(1) of R. 1143/2014 (Anonymous 2014). Coypu (Myocastor coypus), Moenchbruch lake, Hesse, Germany. 25 December 2012, 14:59. The species was first documented in Luxembourg in 1957 at the Alzette river next to Hunsdorf (Municipality of Lorentzweiler). Currently, it is only observed sporadically in Luxembourg. Because of its occurrence in the bordering regions of France (Chiers, Moselle) and Germany (Saar), it is likely that the species will populate national watercourses within the near future (Becker-Krüll & Schaefer 2013). Anonymous, 2014. Regulation (EU) No 1143/2014 of the European Parliament and of the Council of 22 October 2014 on the prevention and management of the introduction and spread of invasive alien species. Official Journal of the European Union 4.11.2014 L 317: 35-55. Anonymous, 2016. Commission implementing regulation (EU) 2016/1141 of 13 July 2016 adopting a list of invasive alien species of Union concern pursuant to Regulation (EU) No 1143/2014 of the European Parliament and of the Council. Official Journal of the European Union L 189: 4-5. Becker-Krüll, L. & P. Schaefer, 2013. Jagdbare Wildtierarten Luxemburgs. Administration de la nature et des forêts, Luxembourg, 96 pp. Last updated on Thursday, September 28, 2017. 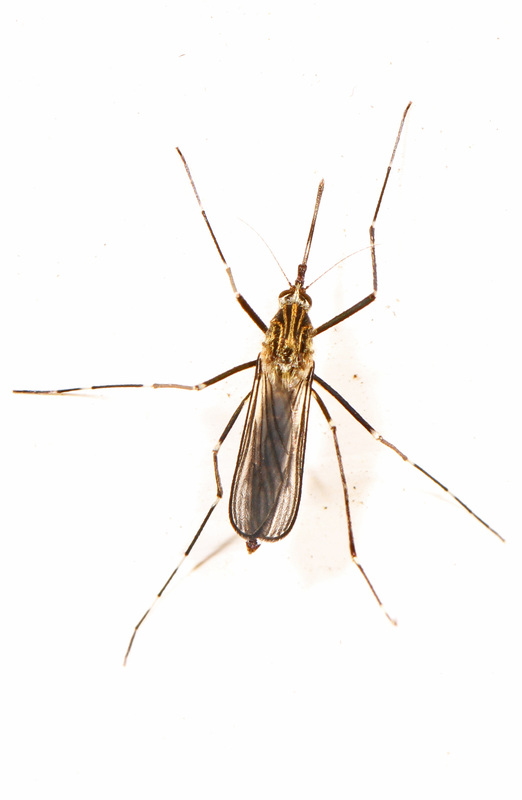 In 2016, the Luxembourg National Natural History Museum has started a survey on mosquito species in Luxembourg. Between July and October mosquitoes have been weekly trapped on 10 sites throughout the country, in co-operation with local and regional partner organizations and private persons. On June 14th and 15th 2017, Mosquito specialist Dr Francis Schaffner from University of Zurich determined the 2016 catches at the Museum. F.l.t.r. 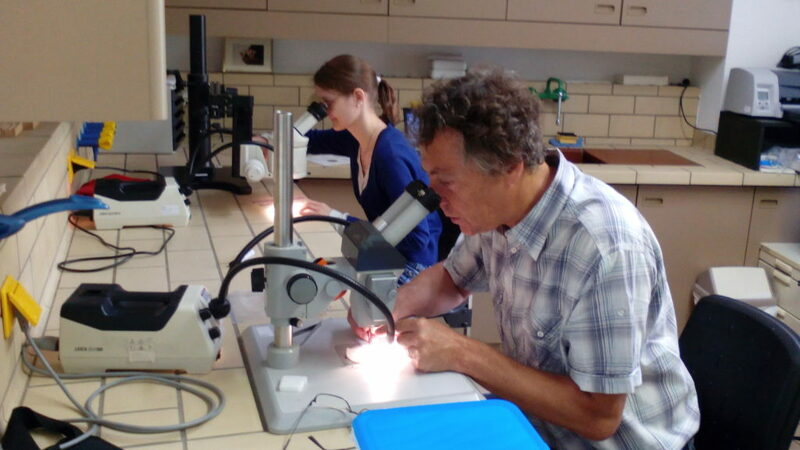 : Svenja Christian (Department of Invertebrates Zoology MNHNL) and Dr Francis Schaffner (University of Zurich) in the Lab of the Department of Ecology. Photo: Dr Christian Ries, MNHNL, 15 June 2016. 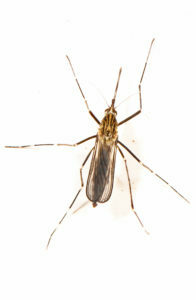 182 mosquitoes were caught during 90 catches from 10 sites. We thank the following partners who have run the traps on their sites. Last updated on Thursday, June 15, 2017. In 2012 numerous colonies of Pectinatella magnifica (Leidy, 1851) (Bryozoa, Phylactolaemata) were discovered in the reservoir of Esch-sur-Sûre (Luxembourg) fed by the river Sûre. The colonies were particularly abundant in the shallow, warm and nutrient rich water near the riverbank, but some colonies were spotted by divers in the reservoir at a depth of 8-9 m in one site and more than 20 m in another site. There is reliable evidence, that Pectinatella was present, but less conspicuous and not identified as such, in 2011 and possibly already in 2010. P. magnifica was hitherto unrecorded from Luxembourg, but known from a site near the German-Luxembourg border near Nennig (Germany, Saarland) where statoblasts were found in 2001 (Massard et al. 2013). ISEIA protocol: C1 (3+2+1+1) (Ries et al. 2017: 68). Massard, J.A., G. Geimer & E. Wille, 2013. Apparition de Pectinella magnifica (Leidy, 1851) (Bryozoa, Phylactolaemata) dans le lac de barrage d’Esch-sur-Sûre (Luxembourg). Bulletin de la Société des naturalistes luxembourgeois 114: 131-148.